A toy in any boy's hand? BIG NO! Found this on Facebook. Felt the need to spread the word. My mom raised me to be a righteous woman so that I deserve a righteous man. She never raised me to be a toy in any boy’s hand, but she raised me to complete the Deen of a pious man.Also, I am not an easy girl who would be impressed with sweet love words, but I am a proud Muslimah who is just like a pearl in its shell. No one can touch it but a brave man who would value it and cherish its beauty. Dear Muslimah's. Know your worth, and Be that One In Million who love to have the love of their Lord more than the love of a boyfriend! 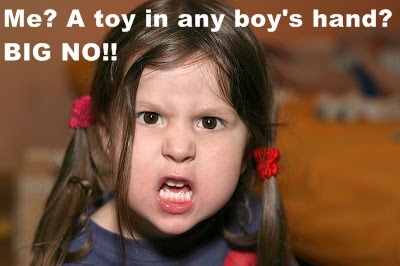 So girls, wanna be a toy in any boy's hand?